Hope you can join me for the upcoming workshop I'm leading at the BAM. vertical succulent planter (in-the-making) from Avant Gardens workshop last summerI typically suggest workshops that meet weekly or for a full week or a full weekend in hopes of encouraging you to take a prolonged break from your usual pursuits in order to concentrate intensely on a new creative endeavor. But this summer is different. My schedule is a bit crazy, and I'm thinking yours may be, too. So this summer I'm suggesting a continuing education opportunity that meets for a mere two hours. But they should be blissful hours spent engaged in a new creative undertaking. 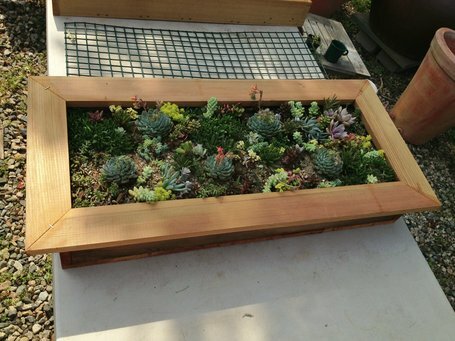 I took a similar workshop last summer at Avant Gardens that focused on creating vertical succulent planters. This summer's offering looks equally enticing and rewarding. "Create an amazing living 12" wreath that can be mounted on a south facing door or wall. Using a sphagnum moss wreath base, you will "plant" dozens (hundreds?) of succulent cuttings which over the next several weeks take root. By September you will have an exquisite living wreath for your south facing door or wall. Includes all materials. Bring clippers if you have them." I'm late mentioning these summer offerings; both start shortly: June 16 (FAWC) and June 17 (Studio North). But it's never too late to open your mind and continue your education, whether your older or younger. I've written here before about the great rewards of continuing education. Whether you sign up for one of these workshops now or next year, you'll be glad you did. "We want to dedicate this week to cultivating the art of being present in a journey through the specific world of Provincetown’s dunes, forest and beaches, bringing together the arts of writing and drawing in response to the natural world. You do not need to know how to draw and you don’t need to be an experienced poet to come along on this journey -- you only need to want to walk through the forest, the sand and maybe a little bit of water, and be receptive to new possibilities. We’ll write in relation to what we hear, touch, smell, taste and see using the building blocks of metaphor, sound and imagery. Poetry will be the foundation of our writing and reading, but all genres are deepened by close attention to world and word. We’ll learn drawing techniques adapted to outdoor field settings (such as blind contour and gesture drawings, drawing with ink and brush, and watercolor wash drawing) rooted in observation and learn field-based drawing techniques, keeping a journal for sketches and writing. Both Mark and Elizabeth are naturalists as well as artists and, as residents of the Cape's tip, bring deep knowledge and love of this place. June 17th - June 22nd. Plan to arrive at Constable Farm, Norwich VT (1285 Union Village Road) by 9am, Monday, June 17th. The workshop fee is: $1,000. "Studio North is a six day intensive building workshop. The workshop will offer students the opportunity to engage with the rural landscape and to imagine, develop and construct inventive design solutions. An architectural education is best experienced through engagement in all aspects of the building process. This workshop will be a fully immersive design experience. The workshop will take place on a 117 acre farm in Norwich, Vermont. Each session will investigate a particular interest and respond with the design and construction of a complete prototype structure. The workshop will be limited to ten participants and lead by architect Keith Moskow FAIA and Robert Linn AIA of the Boston based firm, Moskow Linn Architects. Studio North is currently seeking applicants for the workshop of Summer 2013. The workshop is open to interested students of all abilities. Previous construction experience is not required." Last fall I took my first encaustic workshop. I chose a RISD Continuing Education weekend workshop much like the one RISD is offering this spring. It was great fun to experiment with a new-to-me, unpredictable medium. The encaustic painting I created above was my favorite by-product of the weekend. I say “by-product” because it’s the process of making that so engages me. It’s an added bonus when I’m happy with the resulting artwork. As a RISD alum, I am an unabashed fan of all things RISD. If you live within reasonable driving distance from Providence, I highly recommend you explore RISD’s continuing education offerings. If you live more than a reasonable driving distance from Providence, consider booking a weekend getaway. You’ll be glad you did. Class and schedule are subject to change so check program websites for updates. Take a look at my continuing-education posts from previous seasons to get a sense of the many quality continuing education programs operating in the region. Enroll in a workshop, demonstration, or presentation on a lark, and get your creative juices flowing. Experience continuing-education bliss. Perhaps I’m over-reaching by placing The School of Life in the “web neighbor” category. I suppose House Enthusiast is more of a wannabe web neighbor of The School of Life, the brainchild of Alain de Botton and a few of his colleagues. For one, The School of Life broaches the broader topic of living a fulfilling life, while House Enthusiast wanders the narrower topic of engaging with a fulfilling home. Secondly, The School of Life presents most of its offerings in person in London, as opposed to House Enthusiast’s virtual offerings in the form of online commentary. Still there is a modicum of overlap. According to De Botton in an article in Varsity (the “independent student newspaper for the University of Cambridge”), The School of Life “has big ambitions to define a new, more practical approach to culture.” Bravo. As a fan of culture’s charms, I, too, aim to make it more accessible. The “tiny institution” (De Botton’s words) of The School of Life offers a variety of evening classes, weekend intensives, events, meals, services and more. Each offering, the website notes, has been envisioned “in collaboration with leading authors, artists, actors and academics.” Some upcoming class titles include: How To Have Better Conversations, How To Realise Your Potential, How To Make a Difference, and How To Change Your Mind. As a student of human behavior, each sounds intriguing to me. The School of Life’s online presence includes a blog and videos of the School’s Sunday sermons. How I wish the School offered online workshops and podcasts of the events, too. If you’re not familiar with De Botton, he’s the best-selling author of books ranging in subject from philosophy, to status, to, yes, architecture. You may have read my House Enthusiast post about his thought-provoking book The Architecture of Happiness. I find his work inspirational. So much so that his school and a few other entities and organizations, which likewise foster life learning, have prompted me to ponder creating my own school.